‘Global Art Report’ is a series of dispatches exploring Asian art from abroad by Diplomat editorial assistant Amy Foulds. I covered the British Museum’s fascinating exhibition, The Printed Image in China, a unique and rare collection of Chinese prints last week, and have since found it irresistible to explore the show in more detail. I’ve now zeroed in on two specific pieces from that show to examine in greater detail, and also found that choosing two seemingly different pieces from two very different eras has led to further insight into the art as a whole and the history of printmaking in China. 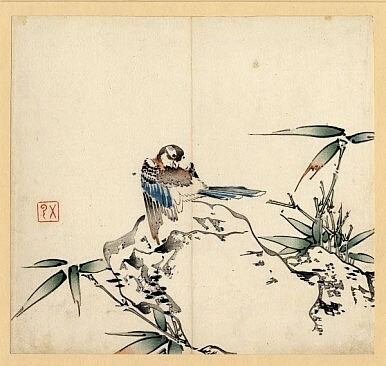 Bird and Bamboo is a 17th century wood print, of which the British Museum has some of the earliest and best-preserved examples. It’s exactly the sort of image I envisage when thinking of Chinese woodblock prints—subject matter drawn from nature, delicately outlined and coloured and surrounded by white space, almost to the point of abstraction. At first glance, there’s nothing that links China National Academy of Fine Art graduate Wu Jide’s 1984 work Chatting Over Tea to Bird and Bamboo. But, in fact, even with 350 years between them, the technique used to produce both is almost exactly the same. Even though technology has allowed Wu to create a larger, more complex work without the need to join numerous parts together, in fact, both use multiple carved wooden blocks and similar water-soluble ink, applied in layers to resemble paint, a continuity I find admirable. Aside from production methods, however, the centuries apart Bird and Bamboo and Chatting Over Tea are wildly different. 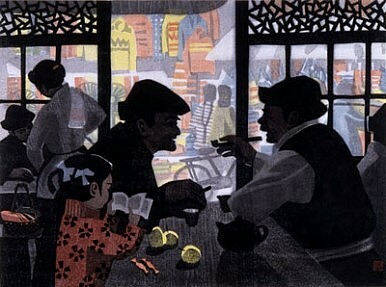 There’s a certain whimsy that I find charming in Wu’s composition of an ordinary noodle shop that almost seems to nod to Renoir’s Le Moulin de la Galette through its purplish palette. Aside from the almost mundane subject matter not represented hundreds of years earlier, it also has a great deal of depth due to its busy, colourful background—a fine departure from the open white spaces of earlier prints. Whilst both works, and the styles they represent, are undeniably beautiful and an integral part of the cultural richness of China, I must admit that as a child of the 20th century, Wu Jide’s modern approach offers much more that resonates with me personally. But, on the other hand, it probably wouldn’t exist at all without the legacy of the Ten Bamboo Studio. After all,it was during the Golden Age of coloured woodblock prints in China, that the Ten Bamboo Studio of Hu Zhengyan in Nanjing produced the Collection of Calligraphy and Painting from around 1633 onwards. The collection, comprising 186 colour prints accompanied by 140 poems spread over 8 volumes,took its inspiration from hand-painted botanical studies and aimed to reproduce them in print form as accurately as possible. It forms the earliest colour picture collection in China, which was later exported to Japan and used as inspiration in the development of ukiyo-e. The Printed Image in China exhibit at British Museum in London runs through September 5. Admission is free. A new art exhibit features Chinese printing, a technology pioneered over 1300 years ago. The Indian PortraitT.V. Santhosh’s Burning Flags Global Art ReportContemporary ConnectionsTiger Mothers To Be Celebrated?